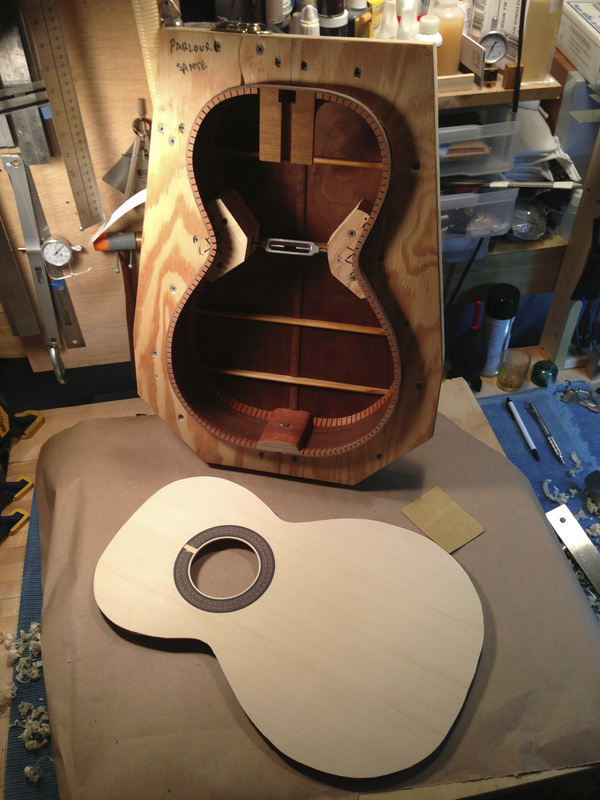 Looking back at 2013, it has been a very productive year in the guitar workshop and other areas of my luthier business. 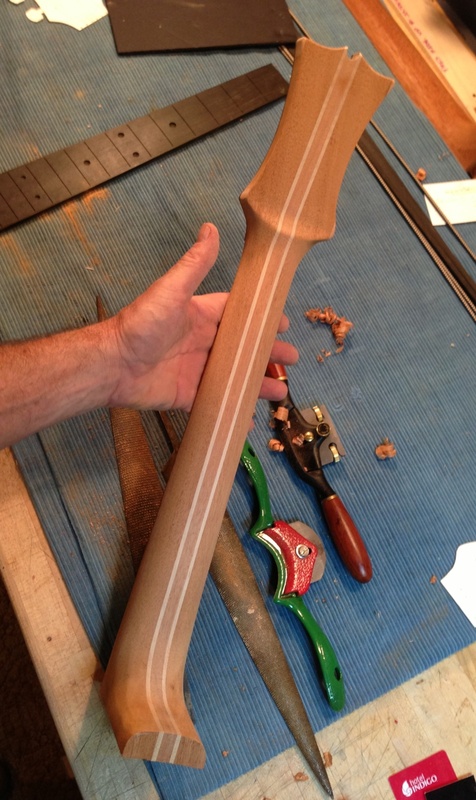 Most recently I completed the closing of a new guitar body. 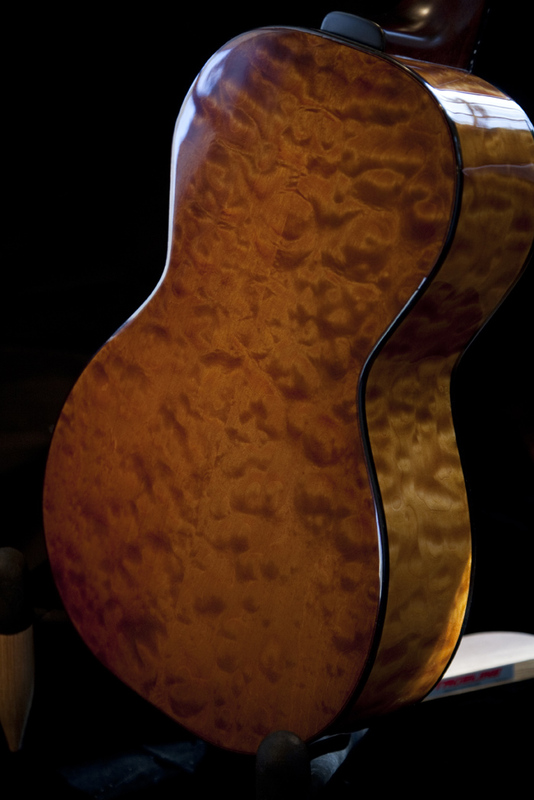 This one is constructed of East Indian Rosewood. The soundboard is from a 40 year old Alaskan Sitka Float Log felled in the 70’s that I purchased from Alaska Specialty Woods in 2010. It has been on my shelf seasoning. The Braces are Sitka from the same supplier. This instrument will be less ornate than my previous builds without to much pearl or embellishments keeping my focus on the sound of this instrument. 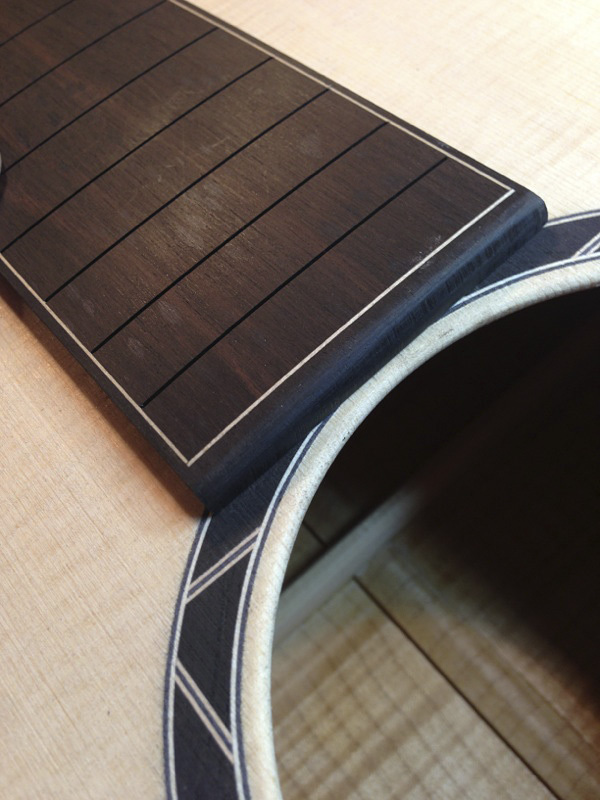 The bridge-plate is Rosewood that matches the sides. The center strip is also cut from the remains of the back. 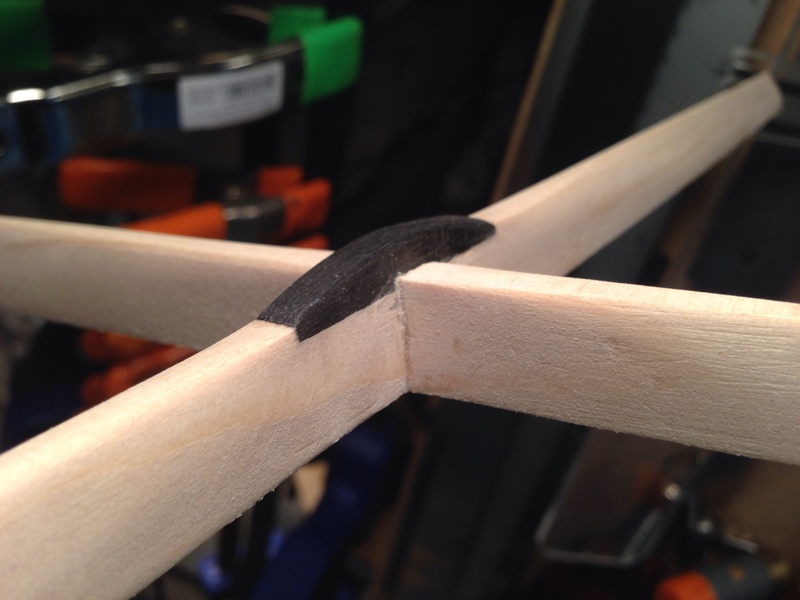 The x brace has an ebony inlay into the joint for added stiffness at the center. This newer body style is smaller and a little more rounded than my large body instruments. It sits comfortably in the lap and has enough body depth to provide a good bass response. 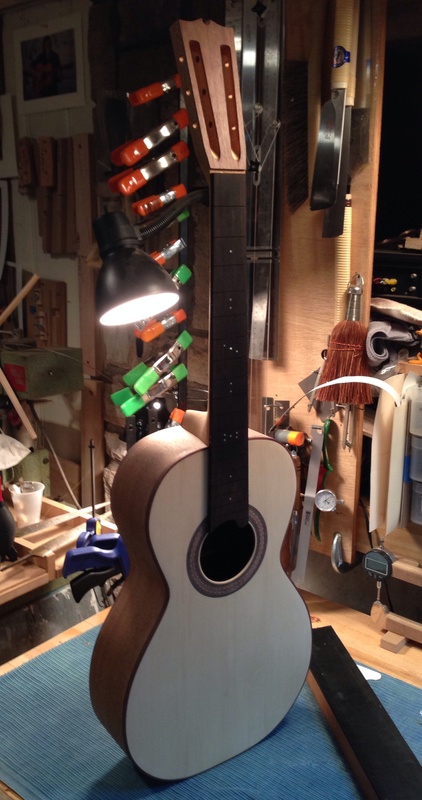 In progress right now is another parlor guitar. 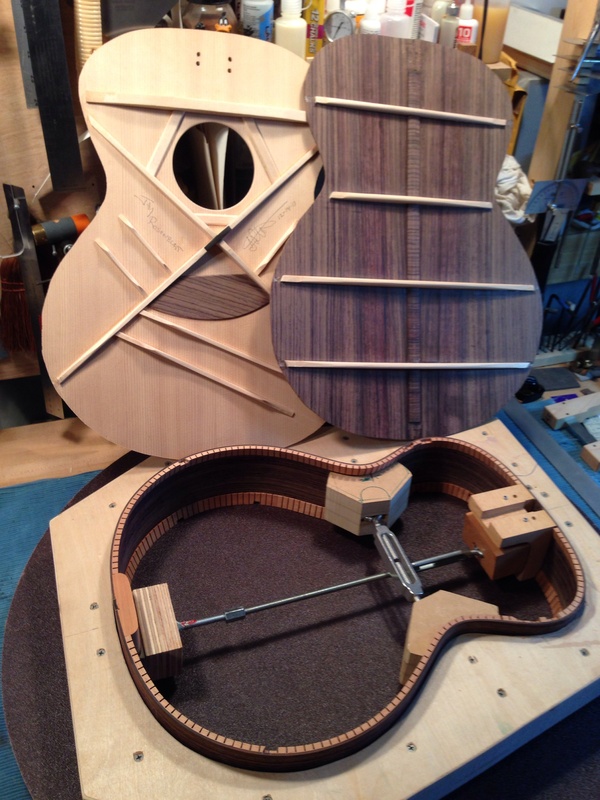 This instrument is about 2/3 through the process. 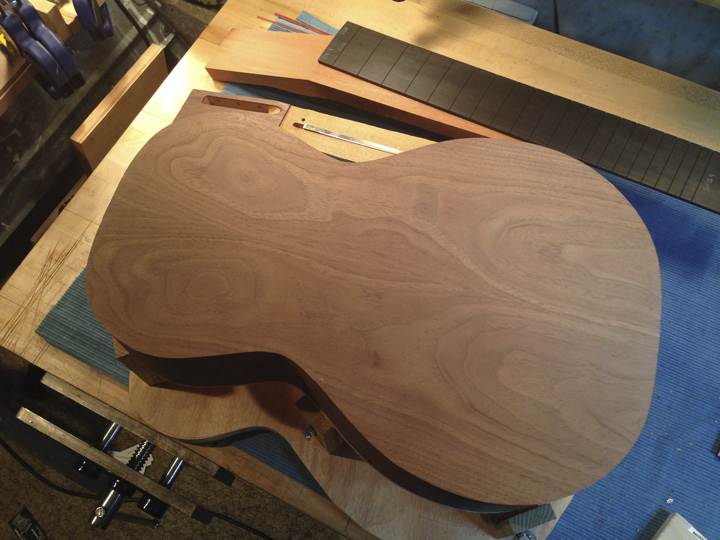 This instrument is constructed of 50 year old American Walnut back and sides. I received an 8 foot by 12″ x 5/4 board as a gift from a friend. There were long checking about a foot into each end of the board. 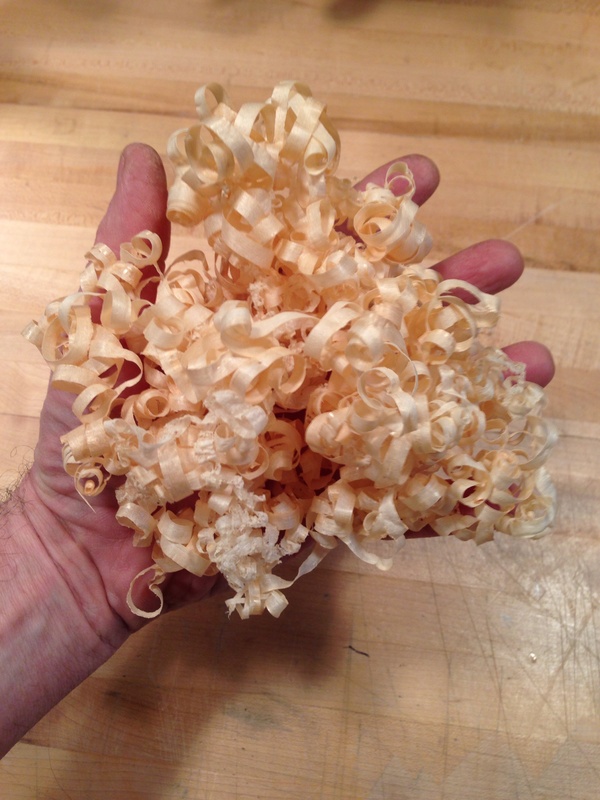 After resawing the boards I was able to salvage 4 sets of backs and sides. The wood was not quarter sawn but being such an old age is very stable and went together beautifully. 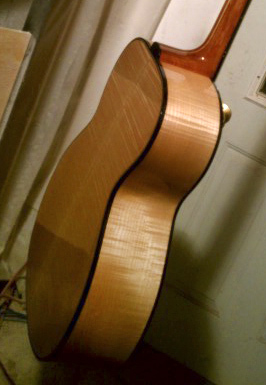 The top of this guitar is Red Spruce that I acquired from Carl Barney. The rosette is a classical style, handmade rosette, of wood fiber and very beautiful from LMI. 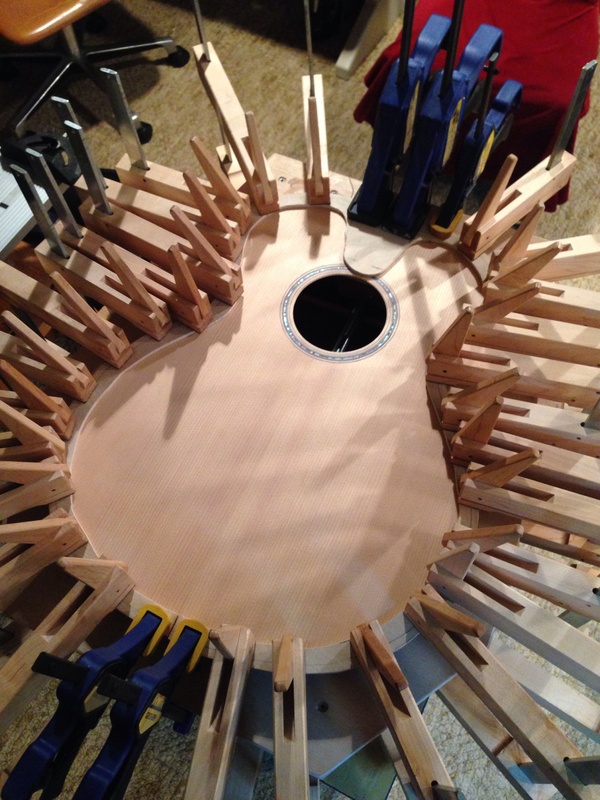 Currently the body is complete, the neck is done a temporarily installed. It needs the nut, bridge, saddle tuner and strings and an initial set up. 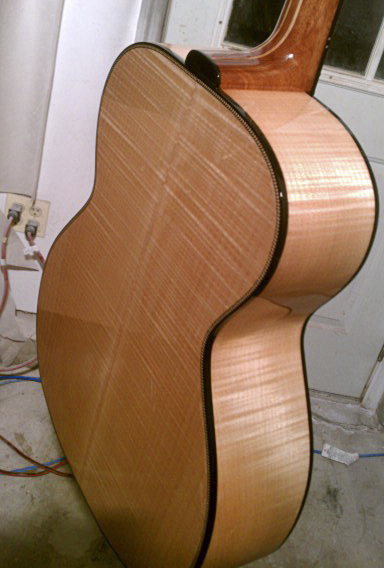 Another instrument almost near completion is this quilted maple large bodied guitar. This one has a Lutz spruce top, ebony geometric rosette, ebony bindings, ebony fingerboard with maple strip inlay, hand cut mother-of-pearl maple leaf position markers, Chippendale headstock design and an ebony bridge. 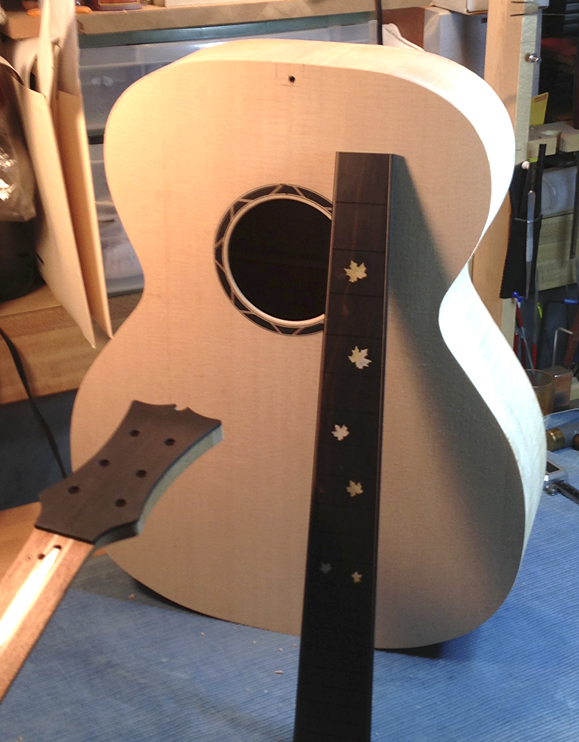 These photos show it in a test assembly for preliminary setup and is now being spray finished by my good friend and luthier, Tony DiDomenico. This should be completed early 2014. 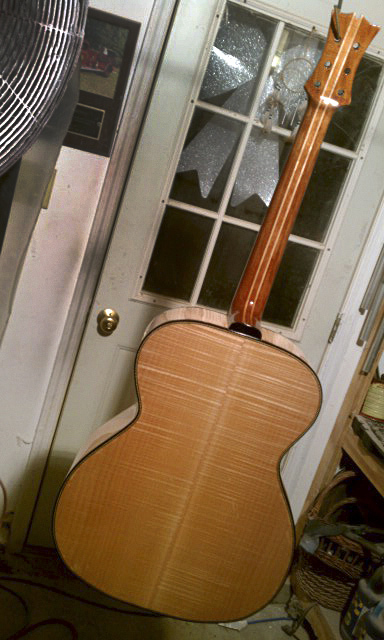 Earlier this year I finished this beautiful Quilted Maple parlor guitar. This has a Lutz spruce top, AAAA Quilted Maple back and sides, hand carved mahogany neck with slotted headstock and Schertler tuners, hand made geometric rosette, hand toned back and sides with a golden amber stain. 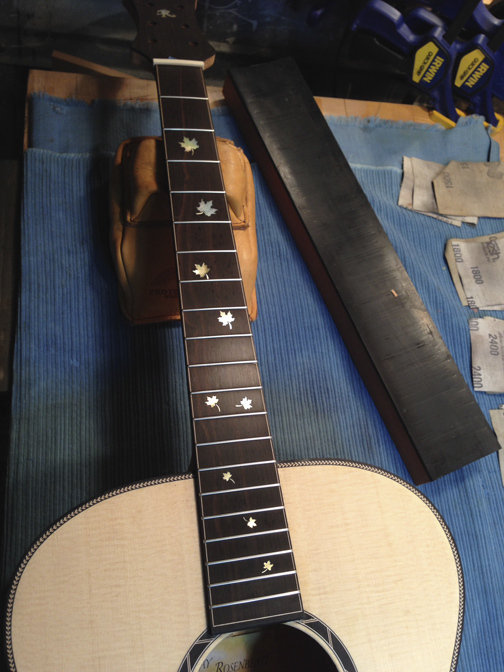 Ebony fingerboard, bridge and headstock, domino dot position markers, Ebony end-graft and ebony bindings . I have other guitars and projects in the works. This year was also a good year for my repair business. 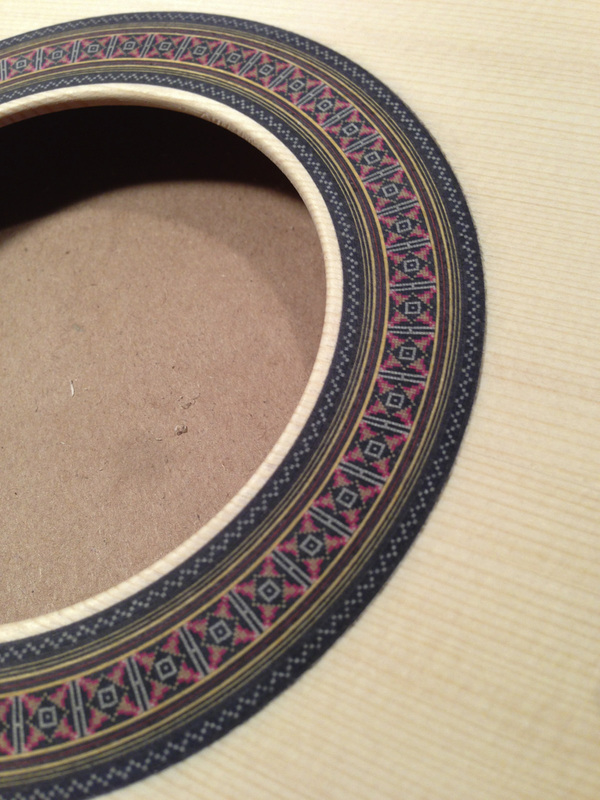 There have been many repairs I have made to keep guitars playable for other musicians. Add to that the addition of the LR Baggs line of pickups and installations and having the Phil Jones line of amps available for sale and I think 2014 will continue to show growth in guitar building and repairs as well. 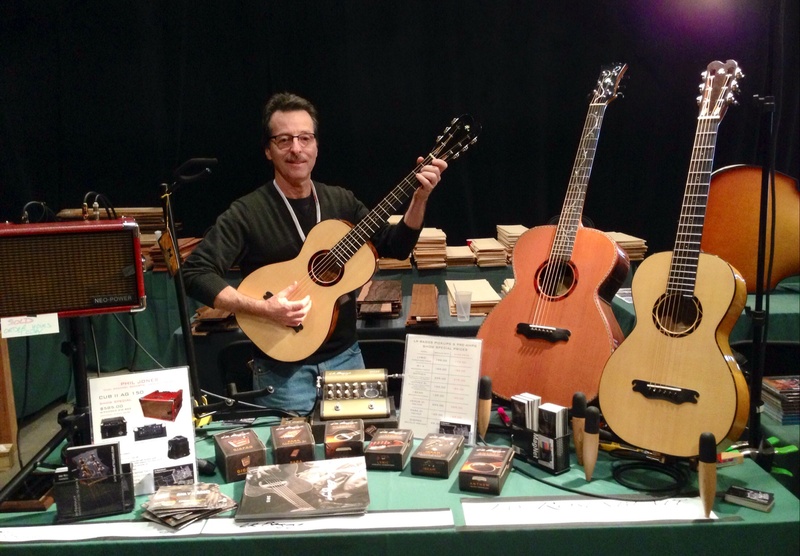 Showing my instruments and selling LR Baggs Pickups and Phil Jones Amps at the Woodstock Invitational Luthiers Showcase in Woodstock, NY this past October, 2013. I want to thank you for reading my blog and I hope you enjoy these posts. Wishing you all a Happy New year, a great year for playing, music and song. All my best to you for peace, health and prosperity. 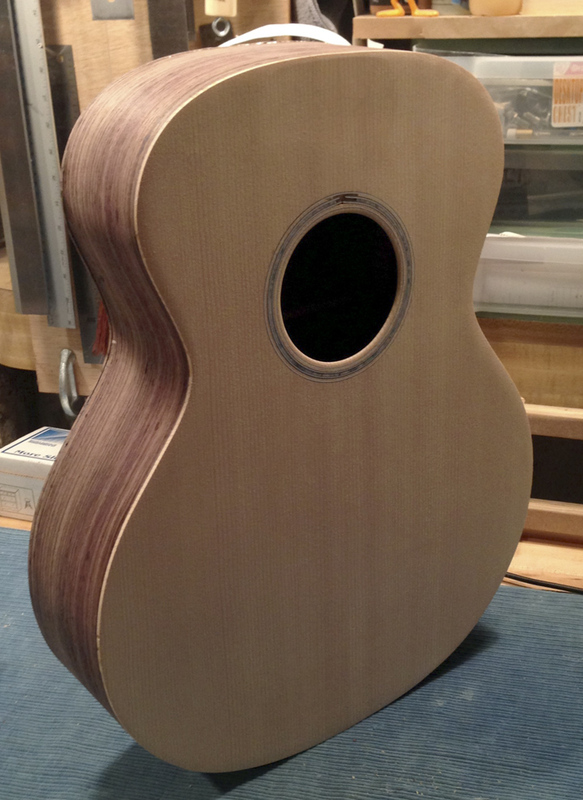 Previous Post Woodstock Luthiers Invitational 2013.